Or so it seemed in the gold fever of the early 1850s. 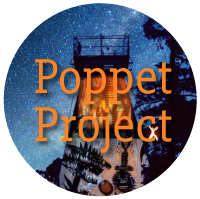 Join the throng making their way to the Poppet Head on Camp Hill this Saturday October 20th for this one-only free performance of Poppet from 8pm. Bring a rug, chair, picnic, family & friends, and a sense of wonder as you experience a layering of evocative and poetic images expressing a multifaceted sense of this place, Bendigo – told through aerial performance, interactive projections, shadow puppetry, live performance & sound, co-created with the people of Bendigo. Did you know Camp Hill was the site of protest against both the Gold License fee (1853) and the Chinese Protection Tax (1859) ? Large-scale site-specific work with community is a quite a challenge but one that the ACTNatimuk crew and associate artists, rise to and relish. This Regional Centre of Culture Commission through Creative Victoria has provided the opportunity to work on this scale on this iconic structure. 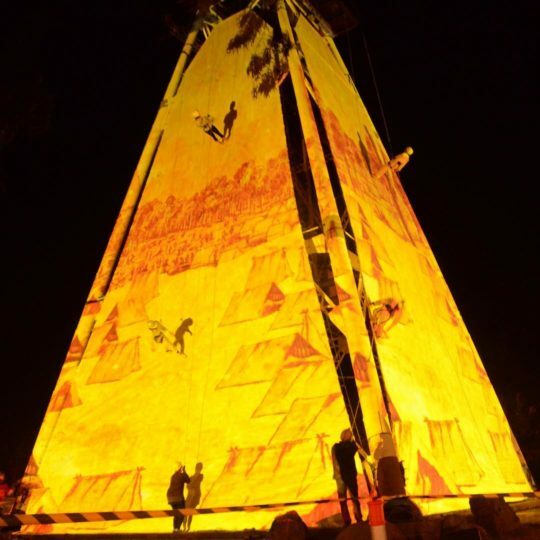 Working on three sides, with three projection surfaces & three teams of aerialists adds to the complexity together with co-ordinating the performance of over 100 community members from choristers to young shadow puppeteers. The ‘crunchy’ work is happening right now as all the different strands of performance and production are wrangled and woven together in a massive team effort to realise this unique work.